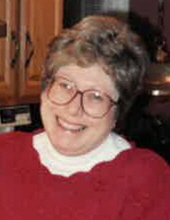 Marie Bernadette “Bernie” English, 75, of Lewisberry, passed away on Monday, February 4, 2019 in Pinnacle Harrisburg Hospital. She was a retired fourth grade teacher for 34 years with Orndorf Elementary in the Northeastern School District, York County and taught for four years prior to that at St. Patrick School, York. Bernie was a member of St. Theresa Catholic Church, New Cumberland; the Red Hat Society; the Riverview Golf Club Women’s League, New Cumberland; and the Lower Allen VFW Auxiliary. She was an avid tennis fan and enjoyed playing pinochle with her collegiate classmates. Bernie was born in York to the late Vincent and Marie (Landis) Haupt. She is survived by her husband of 40 years, Richard K. English; a sister Lorraine Duncan of West Palm Beach, FL; a niece, Julia Duncan and a nephew, James Duncan. Mass of Christian Burial will be celebrated at 11 am on Thursday, February 14, 2019 in St. Theresa Catholic Church, 1300 Bridge St. New Cumberland, PA. Visitation will be held from 9:30-10:30 am Thursday in Parthemore Funeral Home & Cremation Services, New Cumberland. Burial will be in Indiantown Gap National Cemetery, East Hanover Twp. Please send no flowers. Memorial contributions are respectfully requested to either St. Theresa Catholic Church, 1300 Bridge St. New Cumberland, PA 17070 or to Asana Hospice, 4813 Jonestown Rd., Harrisburg, PA 17109. To send messages of condolence to Bernie’s family or for driving directions, please visit www.Parthemore.com . To send flowers or a remembrance gift to the family of Marie "Bernie" English, please visit our Tribute Store. "Email Address" would like to share the life celebration of Marie "Bernie" English. Click on the "link" to go to share a favorite memory or leave a condolence message for the family.